An agricultural enclave in the southwest corner of Connecticut, the village of Southbury, and the surrounding countryside were author and columnist Gladys Taber's writerly muses. 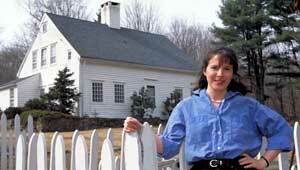 Stillmeadow, Taber’s beloved farm, was the "main character" in her popular column and later in more than 50 books set and written in Southbury. In 2001 Stillmeadow was threatened by the specter of sprawling suburbs. The roughly 100-acre Phillips Farm next door to Taber's farm had been put up for sale. George Phillips, Taber's neighbor, died in 1996 without a will, and his descendants were interested in selling the land. A developer from out of town drew up plans that would have plopped 32-house subdivision on Stillmeadow's doorstep. When word got out that Stillmeadow was threatened, a torrent of support poured in from near and far. Saving Phillips Farm was key to saving other nearby farms and a way of life for a unique agricultural community. In 2002, The Trust for Public Land helped the Southbury Land Trust to permanently protect Phillips Farm as open space includes active farmland, a nature preserve, and public hiking trails.